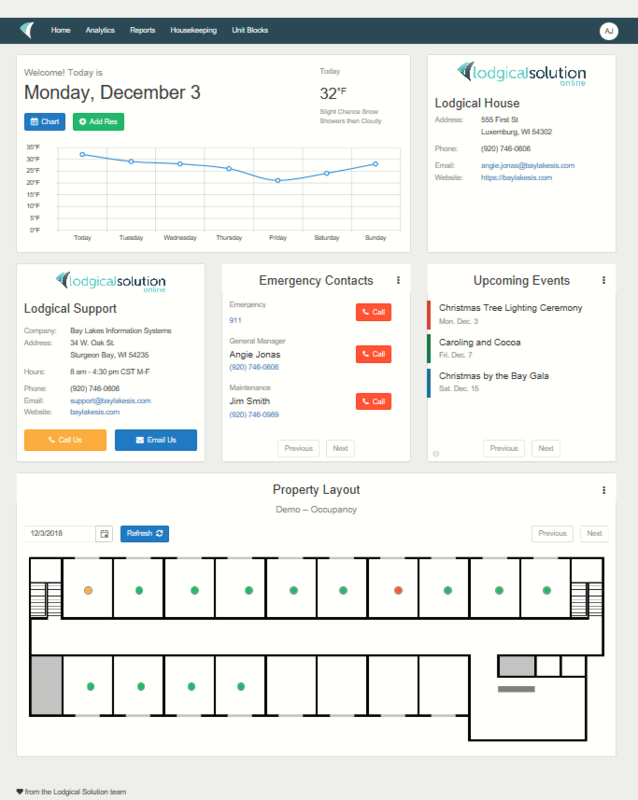 Last week we looked at the home screen on Lodgical Dashboard. This week we will take a look at the Analytics screen. 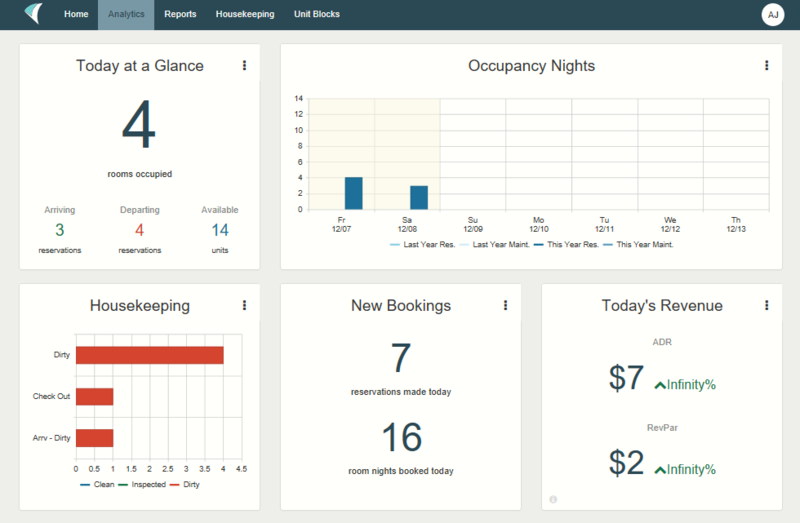 Graphical data displayed pertains to your days occupancy, bookings, and housekeeping. Revenue figures include ADR and RevPar. By clicking the ellipsis you will get options to view the actual report. 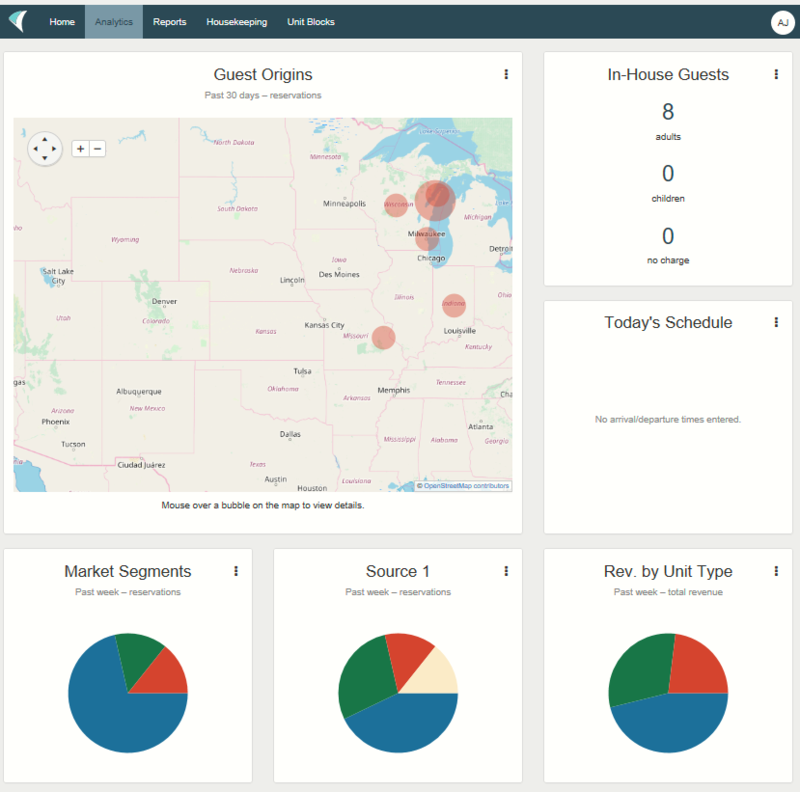 The bottom half of the analytics screen shows you the number of in-house guests, any early arrival or late departures, guest origins and pie charts for marketing data. Lodgical Dashboard is an interactive display on the main screen of Lodgical Solution. The home page includes information that pertains to the day to day operations of your property. Each editable field contains the ellipsis dots, which when clicked, reveal more options. 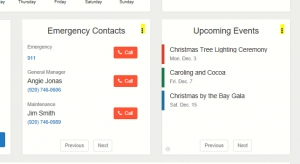 Both the Emergency Contact and the Upcoming Events can be edited by clicking on the ellipsis. The property layout shows occupancy of units based on reservations and the status of each. 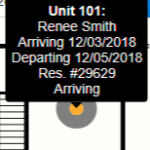 There are 3 colors to reflect a vacant unit, a unit with an arrival for today, or a checked in reservation. 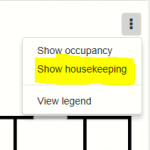 When selecting the ellipsis on the right hand side of the property layout, you will have the option to show housekeeping. 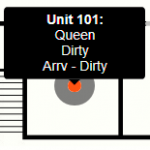 The red dots reflect a dirty unit, or occupied and the blue show a vacant and clean unit. If you hover over the dot, it will give you the information which is shown in the screen pictures above. If you are not set up with the property layout map, please call Bay Lakes at (920) 746-0606. Transferring Funds inside Lodgical Made Easy. If you need to transfer funds in Lodgical Solution from a reservation to another reservation or to an account, we have created a button that allows the double sided transaction to occur from inside the first reservation. It will post the financials to both places. 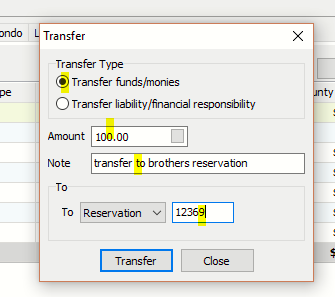 From inside the reservation you wish to transfer funds from, open the financial tab and select the transfer button. Fill in the desired information and click transfer. It will bring up a verification screen. Make sure you have the correct information and click yes. You have successfully transferred the funds from one place to another. Generating and exporting an email list from Lodgical Solution is very simple. You can select certain data fields to fine tune your list for specific marketing needs or stay criteria. Choose from Excel, PDF or CSV formats. To obtain your mail list from Lodgical. 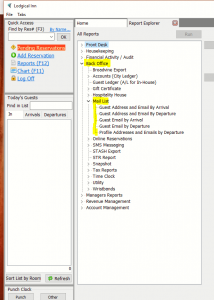 From the reports menu select the back office section and mail list. There are several lists to choose from. On the right hand side of the screen select the date range of the list. You have several other sorting criteria you may choose from as well. You may also select which columns you wish to see by clicking on the columns button and adding a check box to the headings you would like to see. 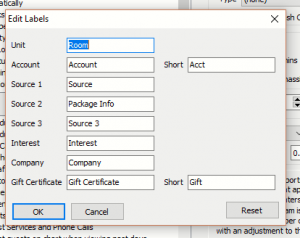 Once you have your list generated, there are several options for exporting. Use the one that works for your marketing program. Ever wish instead of Source 1, Source 2, Source 3 you could make it say something meaningful to you? You can now make custom labels for those fields as well as several more. These labels will also flow through to the reports inside Lodgical. To rename the current source data go to the Menu Bar at the top of the home page. Select the Preferences tab, and on the right hand side, click the Label button. From this screen, type in the custom name for the field in the box. Once you are finished, click OK and then Save. You will need to log off and close Lodgical and reopen in order for this change to take affect. Your changes will be reflected throughout the system with the new names. If you need any assistance please give us a call at (920) 746-0606 and we will gladly help you. Did you know in Lodgical Solution version 11, by clicking on your initials located in the upper right hand corner of the dashboard, you are provided with your access level (and your name) as well as a support option? 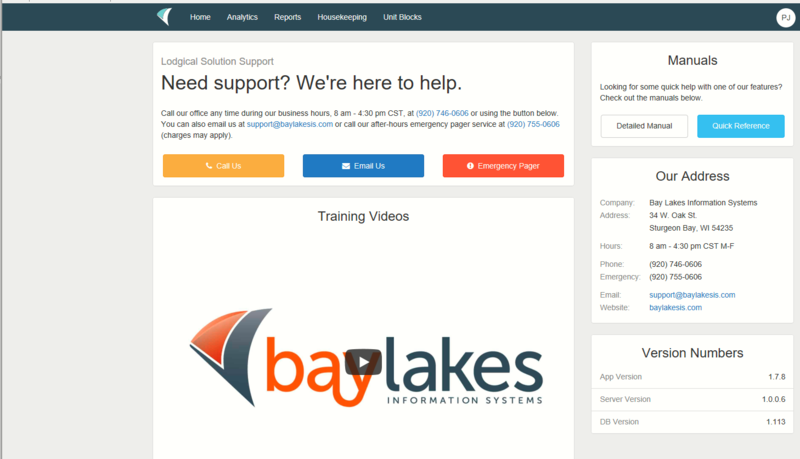 We wanted to make it easy to find help when you need it. Lodgical Solution makes it easy to copy rates from year to year, so you don't have to reinvent the wheel every time the calendar flips over. 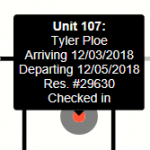 HTML emails can be sent individually in a reservation. Otherwise, you can send a bulk HTML email message to guests arriving and departing on specific dates. Sending emails to your guests with Lodgical Solution not only provides the guest details about their stay, but also keeps you and your clients connected. 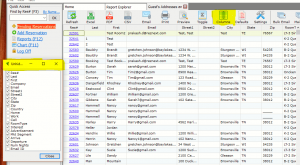 Using the Report Sender feature in Lodgical Solution, you can schedule any report(s) to be sent via FTP or email or downloaded to your computer. 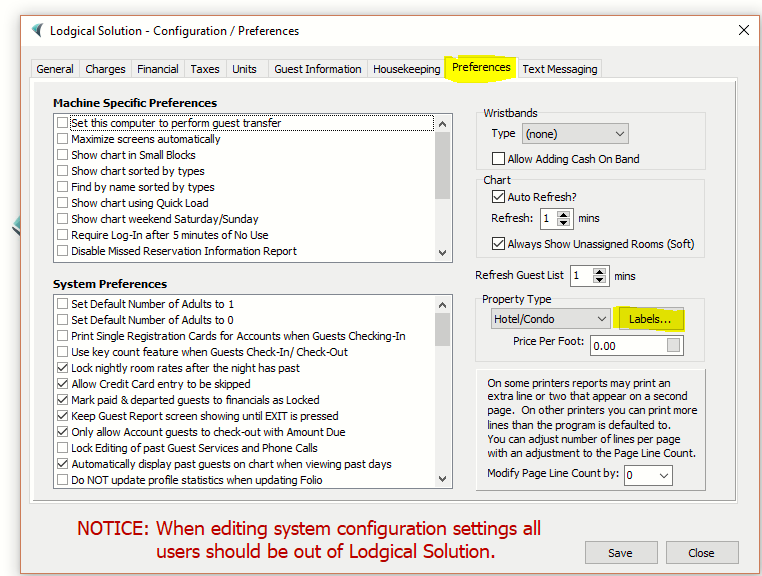 We've added a link to Lodgical Solution Enterprise that will take you directly to SnapShot, potentially saving you some time.